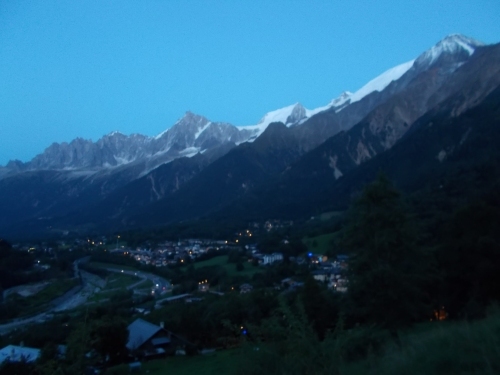 Another Long Walk: Day 1: Introducing... the Tour Mont Blanc! August 26: I spent a pleasant, uneventful week in Boston after finishing my Appalachian Trail thru-hike, but I wasn't done hiking. No, not by a long shot! I spent the week writing blog posts to auto-post for the next month and a half and planning a complex logistical invasion of Europe. Now, my invasion had been launched. The day before, I flew from Boston to Charlotte, then flew overnight from Charlotte to Barcelona arriving early this morning. I lounged around the Barcelona airport for most of the day waiting for my late afternoon flight to Geneva. The Barcelona airport was a new one for me, and the thing that surprised me most was how utterly quiet the airport is. There are no announcements. No gate change announcements, no announcements about which groups should be boarding, no announcements for missing passengers. Apparently, announcements are banned, and I found it eerily spooky. I looked around some shops and when one of the shop keepers asked where I was headed, I told him that I was flying to Geneva to hike the Tour Mount Blanc. "Ahh!" he exclaimed. "Are you competing?" And I wasn't sure what he meant. "Competing at what? I just want to hike around the mountain." And he explained to me that there was currently an ultra run happening on the Tour Mont Blanc. Thousands of runners from all over the world descend onto this trail to run the 110-or-so-miles with more than 30,000 feet of elevation gain around the mountain in a single go. The fastest runner usually takes about 30 hours to complete it. "Yeah...." I told the shopkeeper, "I won't be doing that. I definitely won't be doing that." But it left me a little disconcerted. I, admittedly, hadn't done a lot of research about this trail, and the ultra run was a complete surprise. I didn't much like the idea of sharing the trail with 2,500 sick wackos running completely around Mont Blanc! Finally, in the late afternoon, I headed over to my gate and boarded my flight to Geneva. The flight passed over Lake Geneva on its way to the airport, finally giving me an unobstructed view of Mount Blanc in the distance. Unfortunately, it was in the distance and not up close and personal where we flew by earlier. The flight from Barcelona to Geneva--if you ever get the chance--is absolutely amazing. 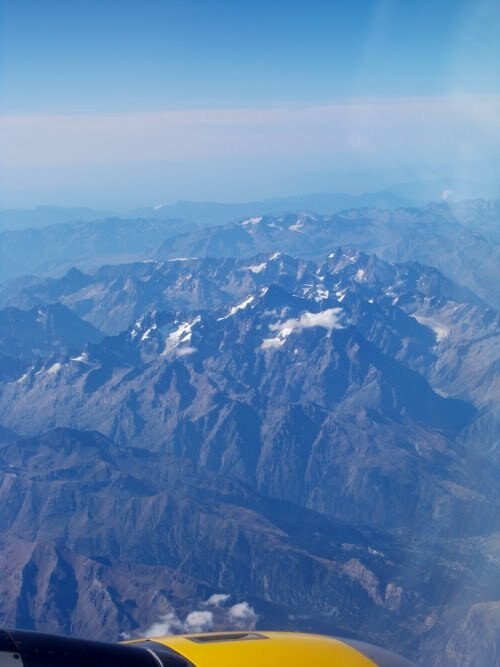 I had a window seat and stared mesmerized--first by the Mediterranean Sea, then by dramatic, snow and glacier-covered mountains better known as the Alps. My view was out the left side of the plane and I watched one particularly large mountain slowly go by. It towered above everything around it. Glaciers snaked down its slopes towards small villages near its base. Was this Mont Blanc? I didn't know. What I did know about Mont Blanc, however, is that it's the tallest of the tallest peaks that make up the Alps peaking at 15,557 ft (4808 m) above sea level. In fact, it's the tallest peak in all of Western Europe. The trail around it runs about 110 miles (170 km), much like the Wonderland Trail around Mount Rainier for those who are familiar with our stateside version of it. And the trail runs through several small towns in the low valleys between ridges around the mountain. The trail also runs through three different countries: France, Italy and Switzerland. To date, I had only visited France. Both Italy and Switzerland would be new adventures for me! And that was pretty much my entire knowledge of the area, so I looked out my airplane window wondering--is that mountain I see the one I'll be hiking around? If so, it looked like it would not disappoint! 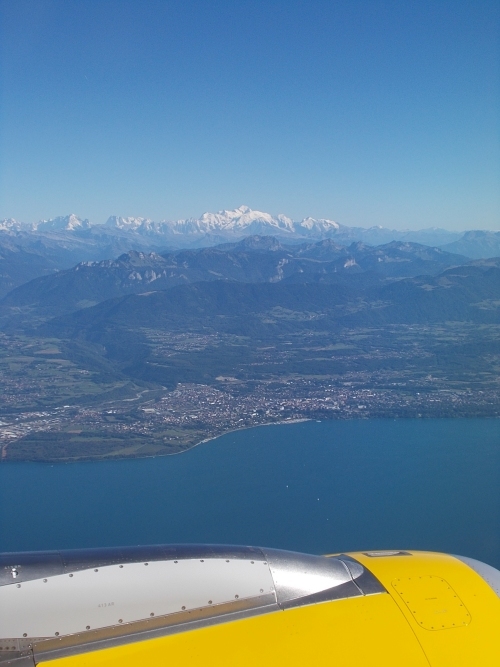 The pilot came on over the intercom--speaking first in Spanish (I was flying on Vueling--a Spanish airline from Barcelona) then in English saying that Mont Blanc could be seen out the windows on the right side of the plane. So I hadn't been looking at Mont Blanc (I'd been looking out the left side of the plane), but it left me itching wanting to see out those windows on the right side of the plane. I wanted to meet my mountain! I strained, leaning forward and back in my seat trying to get even the tiniest glimpse of Mont Blanc through the windows on the other side of the plane, but it was extraordinarily frustrating and my attempts an utter failure. As the plane started to descent into Geneva, it banked over a large lake and eventually I could see the giant peak of Mont Blanc on my side of the plane. It looked spectacular still, although by this point the plane had flown far past it and it was far off on the horizon. For my first close-up view of Mont Blanc, I'd have to see it from ground level after my arrival. That 'geyser' of water in the lake is a giant fountain. Since I never went into the city, this was my best view of it from the plane during landing. The plane landed. I picked up my luggage and navigated through customs and immigration, and took my first steps into Switzerland. My first steps ever in Switzerland, I might add. 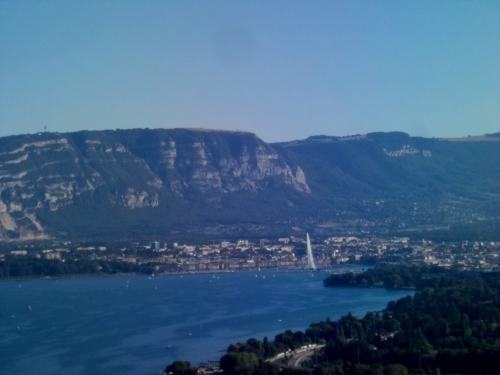 Geneva was the closest major airport to the trail, but it's located right next to the French border and the closest trailhead from Geneva is actually in France. I headed to an information desk to ask about transportation to the trail. Being as late in the afternoon as it was, I half expected that there would be no more shuttles to the trail this evening, and figured I'd try spending the night at the airport, so I was pleasantly surprised when the lady at the desk told me that the next shuttle at 6:30 was already full, but that there was still space on the 7:30 shuttle. I'll take it! She asked if I had accommodations reserved, and I said no, I didn't. I was winging it. She seemed deeply concerned about that, telling me that the ultra run was going on and all lodging along the trail was probably full. *sigh* Of course it would be.... But I didn't let the lack of lodging or reservations discourage me. "No problem," I told her. "I'll camp outside if I have to. I've got all the gear I need!" I continued, lifting my pack. "I'll find somewhere to sleep." I paid for the ticket--which I could do right at the information desk--then wandered down to where she directed me for the shuttle. I had a little over an hour to kill, which was great. I could find something to snack on and look around the airport a bit. I checked in with the shuttle drivers to make sure I knew where they were located and that they knew I'd be heading to the trail. I sat down in a nearby trail and ate a few snacks from my pack--I was famished!--when the shuttle driver waved a come-hither look towards me. Me? My shuttle wasn't supposed to leave for another hour! But I wandered over. "We have room on the 6:30 shuttle," he told me. "Do you want to go now?" So I scraped my plans for wandering around the airport for an hour and jumped into the passenger side seat next to the driver of the driver. The Alps are getting near! But already down here in the valley, the sun has already set--and I haven't even made it to the trail yet! 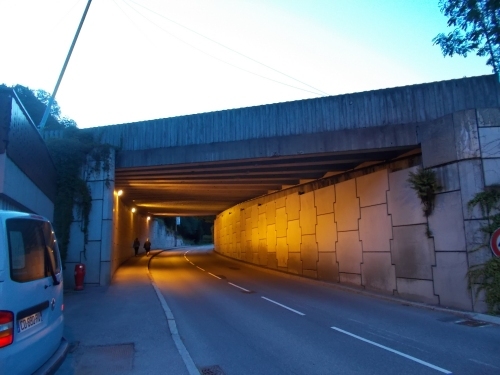 We navigated around the congested streets of Geneva, eventually hitting a highway and faster speeds. 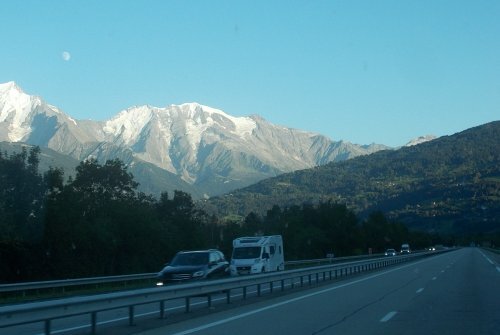 We crossed the border into France without even slowing down, and the distant alps grew increasingly taller and clearer. The driver spoke English, so I chatted with him along the way. He assumed I was there for the ultra run--everyone else on the shuttle bus, as far as I could tell, were there for the ultra run. I was the anomaly. One hour and 15 minutes later, at 7:45, I was dropped off in the center of Les Houches, France. 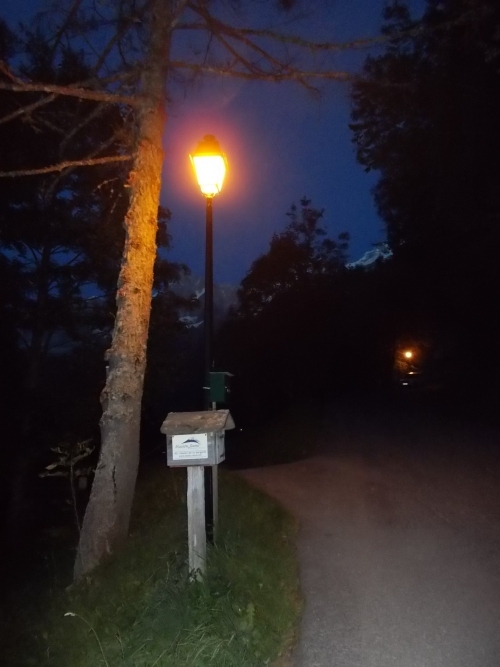 The trail runs directly through Les Houches and I immediately saw the signing pointing the trail out of town. I walked into a couple of the hotels and hostels to ask if they had any space for a hiker--maybe someone who had a reservation didn't show up?--but they all turned me down flat. There wasn't a room to be found anymore. I'd be camping outside my first night in Europe. More problematic for me, however, was my late arrival. The sun had set and darkness was rapidly descending. I had a few snacks for the flight, but I had no fuel for my soda can stove so I couldn't cook a meal, and I didn't have anything in my pack that even resembled a "meal" in the proper sense of the word to begin with. I walked to the local grocery store to do a quick supply run--but it had already closed for the evening. Argh! I did get a bar to fill up my water bottles with water, and the main square was lined with spectacular for the ultra run. I didn't know what direction they were running or when they were expected to run through town, but it was clear that the party had already begun. 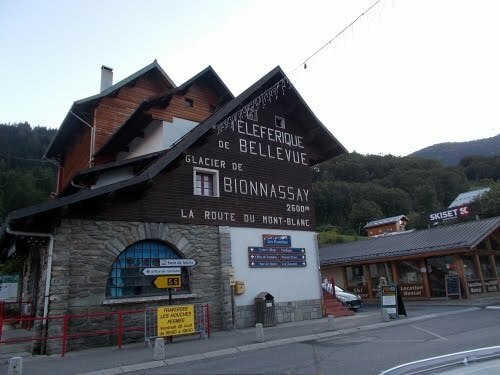 The shuttle dropped me off here, directly on the trail in the small town of Les Houches. I spent a half hour trying to find somewhere to resupply and get accommodations before I gave it up and started following the trail out of town to find a place to camp. I love hiking at night--although I'm less excited about setting up camp at night, and a little concerned about photos for Walking 4 Fun. It's hard to get photos in the dark, and I needed photos for Walking 4 Fun. Photos might be thin along this stretch of the trail. Maybe I could re-walk this at the end of my hike and replace the dark images with daylight ones. The trail quickly climbed, steadily rising higher and up the steep slopes, hoping to find a good place to camp within the first 10 minutes or so, but 10 minutes later, I was still in civilization. Ski slopes and houses sprawled out everywhere, and I kept walking. 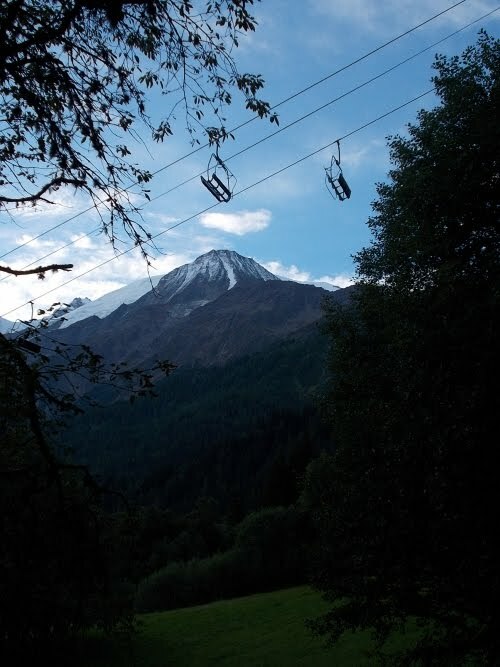 It wasn't until 9:30 at night--about 40 minutes after I left downtown Les Houches--at the edge of a ski run, under a ski lift, that I finally found a location away from houses and civilization where I felt safe to camp. And dang, it was dark by the time I arrived. Not dusk... but deep night with stars twinkling overhead. A nearly full moon lit up Mont Blanc, glistening off it's snow-covered summit. The setting was spectacular! It wasn't an ideal campsite, just off the side of a dirt road that I hoped nobody would be using anytime soon--but it would have to do. I didn't cook dinner--not just because of the lack of fuel, but also because of a lack of food and anyhow, it was too late. I just wanted to eat a snack and go to sleep. I hadn't intended to start my hike, quite literally, less than three hours after I landed in Geneva. I intended to start hiking tomorrow, but in darkness, I'd already knocked off the first couple of miles of the trail. My hike had begun! Heading out of town, in the growing darkness. Where am I going to sleep?! From the center of Les Houches, the trail climbed steeply through ski areas, occasionally providing wonderful views overlooking the town. But darkness was fast approaching! By this point, it was much too dark for me to take photos without a flash or a light. Les Houches may not be a large town, but it does a remarkably good job of sprawling since it seemed like there was no end to all of the houses and structures along the route. I needed to find a good place to camp away from civilization! 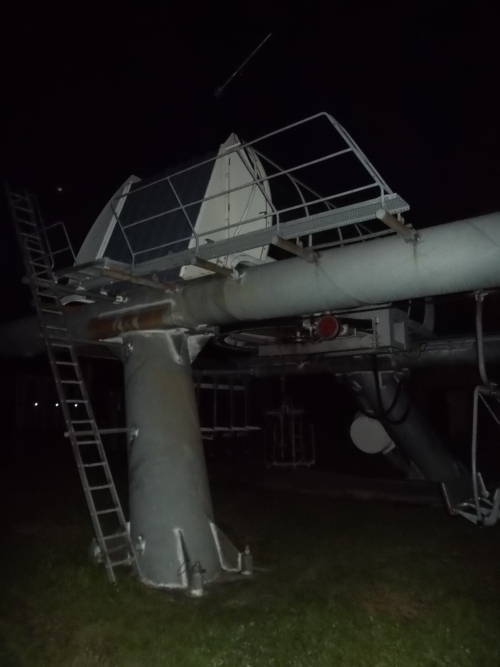 Passing through a ski area, I took a photo of this ski lift. It was becoming increasingly difficult to follow the trail in darkness! I finally found a place to camp--less than ideal, but I was desperate!--and set up camp on the edge of this ski run just under the ski lift with Mount Blanc towering high above. I took this photo the next morning at dawn--none of my photos at night turned out.